Bro. 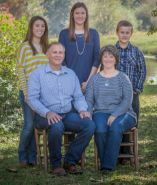 Paul Armstrong has been the Missionary Pastor of Journey Baptist Church for just over 12 years. In his 27 years of ministry, Bro. Paul has pastored churches in Verbena, AL and Orlando, FL. Bro. Paul has been married to his wife, Amy, for 20 years, and they have three children: Emily (18), Hannah (16), and Brady (13). Bro. Rick Scarlett the Pastor of Calvary Baptist Church in Osteen, FL, which is the sponsoring church of Journey.